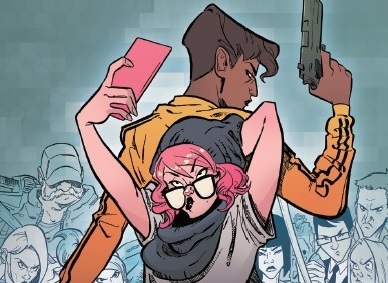 It’s no wonder that actor Rebel Wilson snapped up the film rights to Crowded before Image Comics could get it on the stands. Though artists Ro Stein and Ted Brandt may not have drawn Charlie in Wilson’s image, it’s easy to hear writer Christopher Sebela’s dialogue coming out of her mouth. Charlie has sass and an energetic ignorance, undercut by a dark side that seems to be clear to everyone BUT her. Unless it’s an act. Paced like the best Jason Statham movie you could imagine, except Jason Statham is a tall slender woman of color (which might be better), Crowded starts with a bang (on the inside cover) and barely lets up. Yet Sebela’s strong characterization slams through each page, while Stein and Brandt’s artwork slams the edges of the panels. Set maybe 10 minutes into the future, Crowded works as an adventure, and as a comedy. It’s also the pure satire our culture needs right now — that thing about side hustle isn’t an exaggeration. Charlie makes her living by putting temp gigs together, and if there isn’t someone out there right now doing exactly the same thing, it’s going to be happening soon. The gig economy needs a strong tweak, and Sebela, Stein, and Brandt are giving it exactly that. 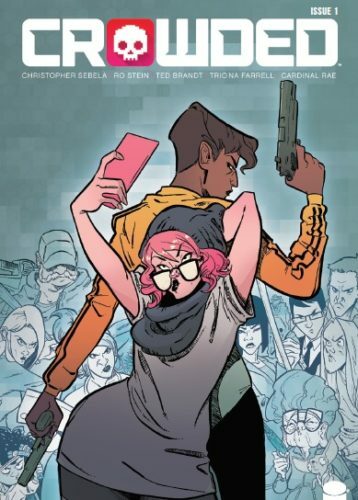 Crowded will make a heck of a movie. But jump on now. It’s a heck of a comic book.